The combination of a very weak and likely short-term Government and an improving economy has led to that most volatile of political situations: Strikes in the Public Service. It is startling the degree to which some sections of the Civil and Public Services are willing to strike compared to those employees in the private sector. Dublin bus drivers have recently won big concessions while Teachers and even An Garda Siochana (the Irish Police) are insisting that their pay claims be met or else strike action will follow. For some groups it is hard to argue though that their pay lags behind what their job and responsibility should command. Take Nurses and Garda for example. These people are at the very front line of the public service doing jobs that many people would find unimaginable. For the Gardai the pressure has been building for years. The widescale closure of Garda Stations in the wake of the economic collapse of 2008-2009 has never been reversed and has put enormous pressure on the police service, while also eroding the confidence that the public have in the Gardai. New Garda recruits earn 23,750 Euro (under 26,000 US$) annually after their training, rising to 35,840 Euro (39,000 US$) after 5 years and 42,138 Euro (under 46,000 US$) after ten years, according to the 2016 Garda recruitment campaign. By comparison a New York City Cop receives 41,975 US$ (under 39,000 Euro) in their first year, rising to 76,488 (about 70,000 Euro) after 6 years. The US Bureau of Labor reports that nationally US police officers receive an average annual salary of $56,260 (under 52,000 Euro). A British cop in London receives up to 22,896 (about 28,000 US$, under 26,000 Euro) on commencement rising to 30,471 UK£ (approx 37,300 US$, 34,000 Euro) after 5 years. It must be acknowledged therefore that the salary scale in Ireland for new recruits is relatively low. Irish Nurses dont fare much better. A qualified registered Staff Nurse in Ireland receives a starting salary of 23,361 Euro according to the Irish Nurse and Mid-Wives Organization, rising to 34,666 Euro after 5 years. An entry-level Registered Nurse in the USA receives between $41,181 and $71,719 (between about 38,000 Euro and 66,000 Euro) depending on the location (it varies State to State), according to payscale dot com. 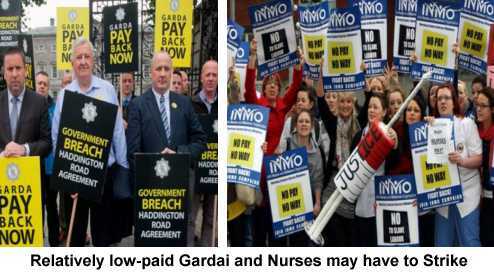 So it must also be acknowledged that Nurses are also relatively poorly paid in Ireland. In fact, these numbers starkly illustrate just how undervalued the nursing and police forces are in Ireland. And before you shake your head in disregard just imagine a situation where a Garda has to confront violent criminals or thugs and then imagine a nurse in an Emergency unit treating elderly and badly injured people with the wards jammed to the hilt, with patients lying on trolleys, chairs or even the floor. Could you do that job? I couldn’t. While some cosseted sections of the Public and Civil Service agitate for more money and to strike, knowing full-well that they can never be fired from their protected existence (short of physically assaulting someone or stealing huge amounts of money), they might first reflect on their ‘colleagues’ who are less well off than they are. They might consider this given that there comes a moment when we all need a Garda or a Nurse.